I’ve worn this asymmetrical sweatshirt top with skinny jeans, but today I’ve paired it with my skinny cargos. While I really love this top- it’s warm, comfy and interesting with the cool hemline… something is definitely missing! I think I need a necklace! Something to tie the look together! At least it’s better than my original look on the right. These are my old cargos- and they are just too baggy and shapeless (sort of like my khakis from yesterday). I have to say, this outfit is cuter in person… I swear! I really love these pants- they are so comfy and a great alternative to jeans! Outfit update! Great minds think alike- my sister saw my posting for today and emailed me a pic of herself- totally by coincidence she is wearing basically the same outfit as me today! LOL! I actually like hers with the red jeans better! So cute! 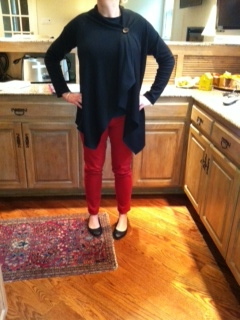 Here is Erin wearing the same top and red skinnys. Strangely, she opted to skip a necklace as well- although I still think I need one! try some chunky beads or a large amber necklace. Oh, I like the idea of a amber necklace! Cool thinking! Thanks! Love this top and it’s a cute outfit! How about a silver brooch? Not very daring but I love brooches when a top or jumper I’m wearing doesn’t look right with a necklace. Looks great! How about a big chunky bracelet or a stack of bangles?